Don’t wear clothes that are doused in gasoline. That tip is free. In all seriousness you should be decked out with a lot of protection including a certified welding helmet, leather welding gloves, welding jacket, full leg coverage and leather shoes. Make sure that there is nothing around you that can conduct any electricity such as a wet floor. Also, make sure there is nothing around that can catch fire like rags, paper, oil, etc. In general it’s best just to clean up the entire area before you start. Before you start, make sure that the machine is operating properly. Check to make sure that nothing is frayed, the machine is plugged in correctly, the settings are right, etc. If any of these things are wrong you could have some serious problems to deal with. Another extremely important element of your welding is ventilation. If you are welding at the very least you should have a door open to bring some fresh air in. 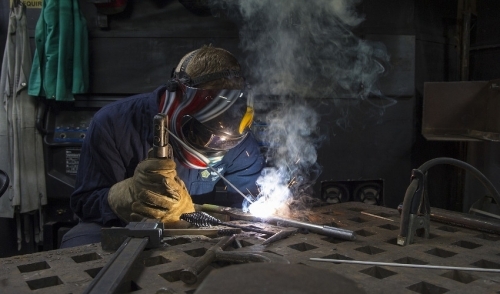 Ingesting the smoke that comes off of what you are welding is very bad for you.